Fantastic value for money money upholstered two seater sofa in a wide choice of fabrics, faux and genuine leathers. Two tone opportunities. Manufactured to a high standard in the UK and delivered in 7-10 days from order. Cost effective two seater sofas designed for contract use in a comprehensive choice of fabrics, vinyl's and leathers. Phoenix sofas are available in a matching tub chair. 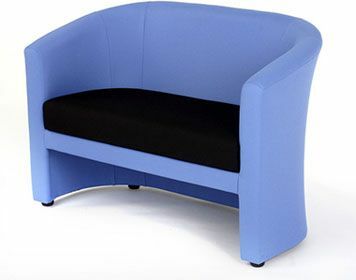 These commercial sofas are manufactured in the UK and available on a two week turnaround.